For Melissa Johnson, working with the Milwaukee Film Festival meant designing a dollhouse. 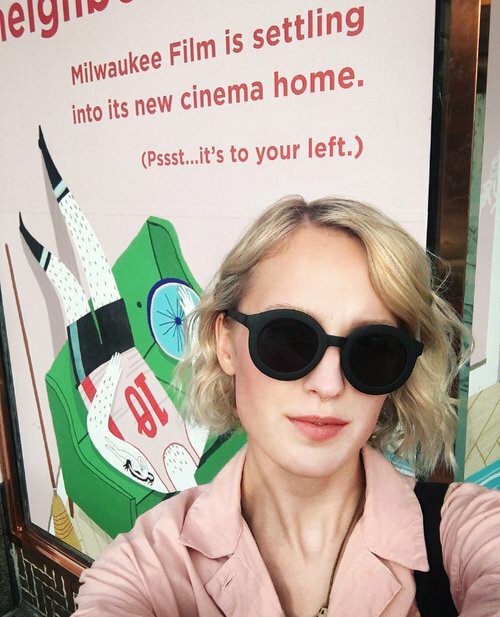 Johnson, a West Bend East High School graduate, created the illustrations associated with this year’s Milwaukee Film Festival. The festival, which showcases a wide variety of films, begins Thursday and runs through Nov. 1. Johnson’s art is featured on the cover of the festival’s program book and is generally used for advertising. Johnson’s program book cover depicts a series of different rooms and scenes that, when joined together, form a cutaway image of a dollhouse. This was a concept presented to her by Katlyn Griffen, MFF’s graphic designer, with the intention of emphasizing a theme of community. Outside of this initial idea, Johnson had plenty of freedom to expand with her own creativity. 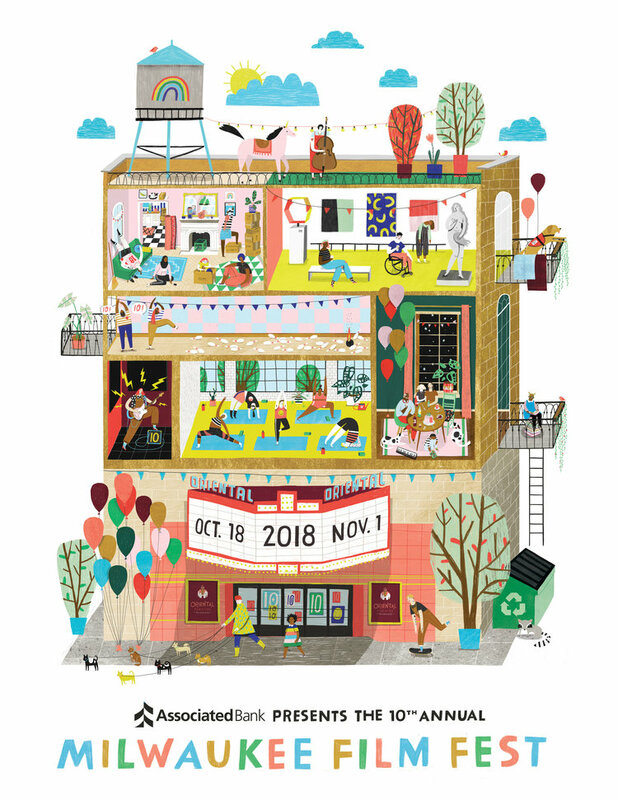 Melissa Johnson’s cover illustration for this year’s Milwaukee Film Festival. Photo courtesy of Johnson. Griffen keeps a list of local artists and illustrators whose work she admires. After deciding what direction she wanted to go in for this year’s artwork, she looked to see if anyone on her list would be suitable to collaborate with. “Melissa felt like a perfect match because her style is unique, playful and approachable without seeming juvenile,” Griffen said. Griffen feels that Johnson delivered more than she had imagined for the project’s end result. Johnson actually included herself and her boyfriend in one of the rooms of the dollhouse. “I thought it was just a sweet thing to do and something that would be like an inside joke between us, but apparently it’s not so inside anymore,” Johnson said with a laugh. She also couldn’t help adding her two dogs, Bambi and Sparkles, into the image. Artist Melissa Johnson sneaked herself and her boyfriend into one of the rooms of the dollhouse. Photo courtesy of Johnson. Besides contributing to MFF, Johnson has been working at the Shepherd Express for the past two years, where she now serves as the illustrator and graphic designer. She occasionally creates illustrations to accompany various articles or makes covers. Much of her work can be viewed at her website. 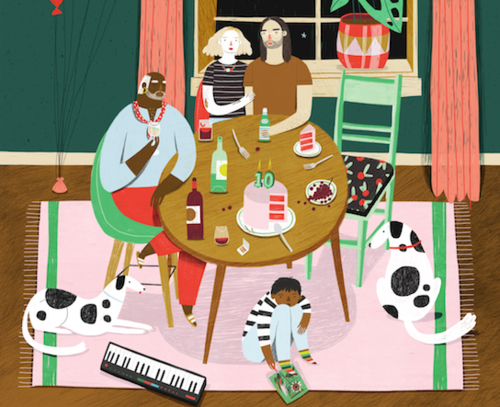 Before working at the Shepherd Express, Johnson attended the Milwaukee Institute of Art and Design, where she graduated with a BFA in integrated studio arts and a minor in illustration. Jay Krueger, an art teacher at East High School who had Johnson in class before she graduated in 2012, is excited by what she has accomplished. “I was impressed by the fact that I have a former student that is now doing something on such a big stage,” Krueger said. He went on to explain that Johnson might be among the most talented art students that he has taught in a long time. “Melissa was probably one of the more meticulous and creatively intuitive students that I’ve ever had,” Krueger said. 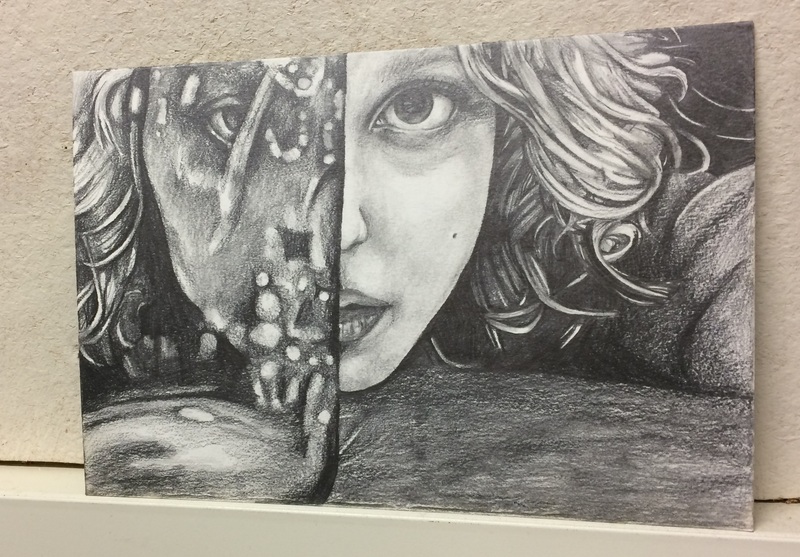 East High art teacher Jay Krueger keeps some of graduate Melissa Johnson’s old high school artwork in his office. Photo by Samantha Dietel, Editor in Chief. As a high school student, Johnson enjoyed a multitude of art classes, including Krueger’s ceramics and Advanced Placement Studio Art courses, the latter of which she took twice. East German teacher Laurie Wanta is also pleased that Johnson was selected to create the MFF artwork. Though Johnson had never been Wanta’s student, she has long been close friends with Wanta’s daughter Samantha Beaver. Johnson and Beaver attended WBHS together and collaborated to paint a mural in the foreign language hallway that had been left unfinished by a previous student. The mural focuses on different aspects of Germany’s culture, especially several of its historical figures. Besides simply painting over the sketched outline provided by the past student, Wanta says that Johnson added both German actress Marlene Dietrich and anti-Nazi activist Sophie Scholl to opposite ends of the design. 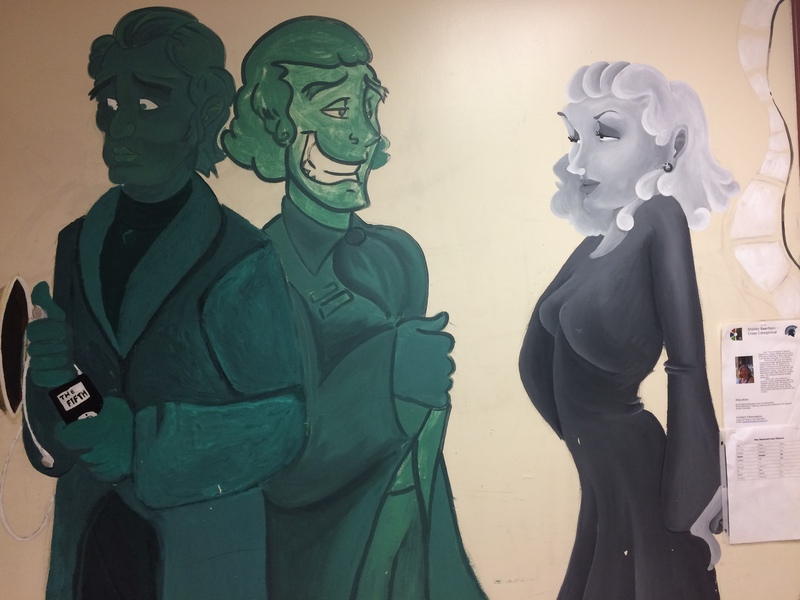 Johnson added an image of actress and singer Marlene Dietrich to the German mural in the U hallway. She is facing anti-Nazi activist Sophie Scholl, who stands at the other end of the painting. After all these years, the mural is still incomplete. Photo by Samantha Dietel, Editor in Chief. However, this is not the only artistic mark that Johnson left during her time at WBHS. She also received a request for a mural from one of her own teachers—East Spanish teacher Beth Kastner. Kastner brainstormed ideas with Johnson and ultimately suggested a painting of Mexican artist Frida Kahlo. Johnson, of course, obliged. Johnson’s final mural at WBHS was for her graduating class in 2012. 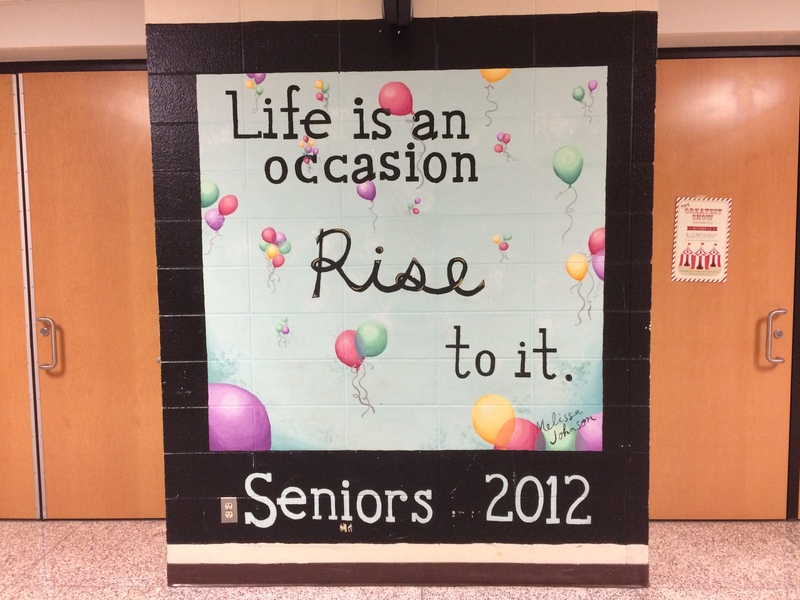 Melissa Johnson’s 2012 class mural still resides in the L hallway near the art classrooms. Photo by Samantha Dietel, Editor in Chief. When asked what inspired her to become an artist, Johnson explained that creating art is something that she has just always enjoyed. Johnson also took classes at MIAD while she was still attending WBHS. 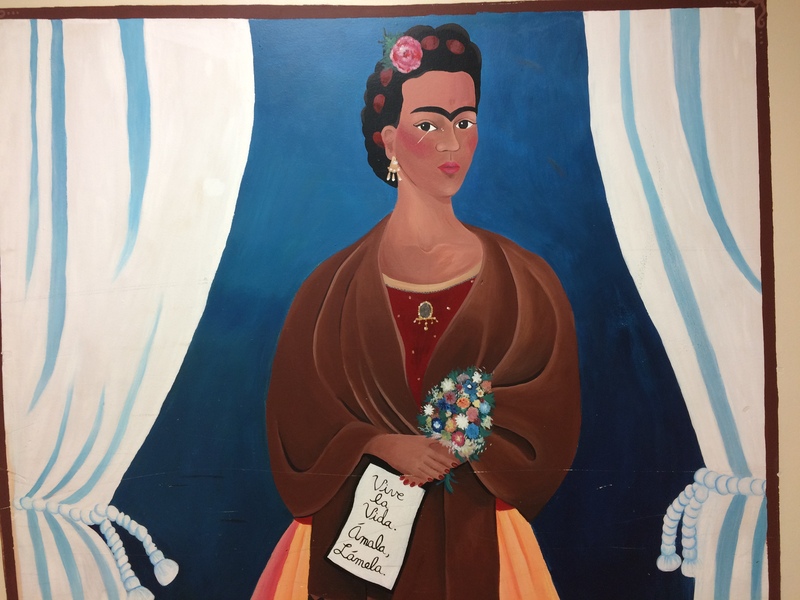 Melissa Johnson’s painting of Mexican artist Frida Kahlo can be found in the W hallway, near the foreign language classrooms. Photo by Samantha Dietel, Editor in Chief.